Dark chocolate flax 15 hand Rocky Mountain stallion CGF Absolutely Incredible (Able). Thankyou to Mike Hartong of Cedar Grove Farm for sharing these photos of Able with us. Able's Dam is Adam's Sara Jane, who is also the dam of Diamonds Are Forever. Able's Sire is Smith's Mr. Incredible by the legendary Choco Dock. 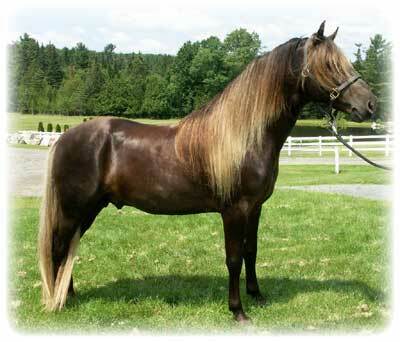 His owners say of him that he "is extremely smooth gaited, very willing and exceptionally even-tempered. A real gentleman!" 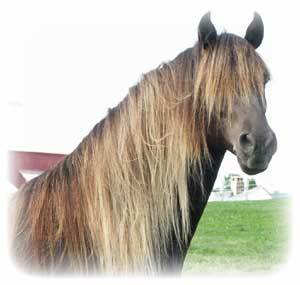 Able distinguished himself in 2005 by being the High Point Trail Pleasure Stallion on both the United Mountain Horse and Kentucky Mountain Saddle Horse Association show circuits. Able returned home after the show season and is now available for breeding in 2006, standing at Cedar Grove Farm, Peacham, Vermont. He is certified both Rocky Mountain and Kentucky Mountain.